For all those that came out and supported the FIRST Disco Soupe DC – THANK YOU!! We had a blast, saved food from landfills and fed more than 200 homeless individuals. Enjoy and share this video to help build our DC Disco Soupe community! Many of us have heard the expression, ‘don’t be a square’. Usually this term has a negative connotation but as another saying goes ‘it’s all relative’, and indeed it is so. To make the point we introduce you to the ‘Square Watermelon‘. Now, before you go and think it’s some joke or a freak GMO project, we’d like to inform you that it is all done naturally, and quite easily too! 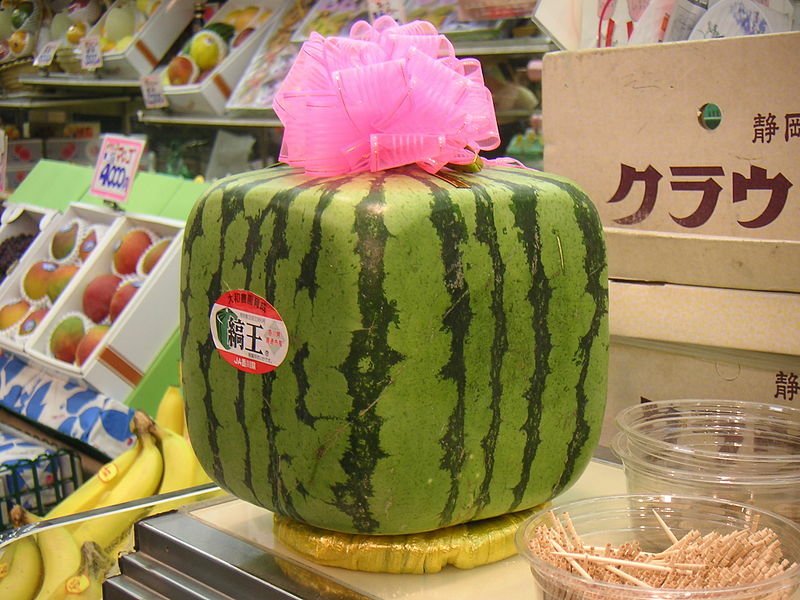 The square-shaped watermelon is an experiment project of the Japanese who were actually trying to make a heart-shaped watermelon. To do that they placed a transparent square box around a small watermelon still growing on the vine. It is important to put something transparent so that the sun light can still reach the fruit and allow it to grow. This technique is very useful, both for saving needed space in the fridge, as well as perfect for shipping the fruit to other countries, especially since all the square watermelons will be snuggly packed without rolling back and forth to cause damage to their neighbour. Now imagine if it was possible to do this with all the other fruits and veggies that grow. To naturally control their shape without changing their genetic code. To try growing a square watermelon of your own, check out this website. I guess in the end it does pay off to be a square…but only sometimes. Move over fair trade and organic produce, there’s a new way to show support for the environment. A fashion company called Hoyan Ip is finding a link between fashion and food waste by reusing materials from the two industries, and creating something new. The “Bio-Trimmings” project uses clothing that is no longer in season, and adds on food pieces, such as chips, onto the clothes. The designer cooks, dries, paints, molds and adds the food onto different garments. These colorful food scarps embellish the clothes by adding color and texture rarely found in traditional fashion. Although this trend might take a while to catch on, especially in circles of hot couture, it is surely a new way of putting a dent on the global trend of our ‘trow away society’. We hope this London based fashion company paves a way for other future projects that address the issue of ‘food waste’ in nonconventional and inspiring ways.